vSphere Monitoring and Performance Guide, Chapter 7 “Performance Monitoring Utilities: resxtop and esxtop”, page 45. The resxtop and esxtop command-line utilities provide a detailed look at how ESXi uses resources in real time. You can start either utility in one of three modes: interactive (default), batch, or replay. The fundamental difference between resxtop and esxtop is that you can use resxtop remotely, whereas you can start esxtop only through the ESXi Shell of a local ESXi host. You can run the esxtop utility using the ESXi Shell to communicate with the ESXi host’s management interface. You must have root user privileges. The esxtop utility reads its default configuration from .esxtop50rc on the ESXi system. This configuration file consists of nine lines. The first eight lines contain lowercase and uppercase letters to specify which fields appear in which order on the CPU, memory, storage adapter, storage device, virtual machine storage, network, interrupt, and CPU power panels. The letters correspond to the letters in the Fields or Order panels for the respective esxtop panel. The ninth line contains information on the other options. Most important, if you saved a configuration in secure mode, you do not get an insecure esxtop without removing the s from the seventh line of your .esxtop50rc file. A number specifies the delay time between updates. As in interactive mode, typing c, m, d, u, v, n, I, or p determines the panel with which esxtop starts. NOTE Do not edit the .esxtop50rc file. Instead, select the fields and the order in a running esxtop process, make changes, and save this file using the W interactive command. The resxtop utility is a vSphere CLI command. Before you can use any vSphere CLI commands, you must either download and install a vSphere CLI package or deploy the vSphere Management Assistant (vMA) to your ESXi host or vCenter Server system. After it is set up, start resxtop from the command line. For remote connections, you can connect to a host either directly or through vCenter Server. The command-line options listed in the following table are the same as for esxtop (except for the R option) with additional connection options. NOTE resxtop does not use all the options shared by other vSphere CLI commands. [portnumber] Port number to connect to on the remote server. The default port is 443, and unlessthis is changed on the server, this option is not needed. [username] User name to be authenticated when connecting to the remote host. The remoteserver prompts you for a password. You can also use resxtop on a local ESXi host by omitting the server option on the command line. The command defaults to localhost. By default, resxtop and esxtop run in interactive mode. Interactive mode displays statistics in different panels. A help menu is available for each panel. You can use various command-line options with esxtop and resxtop in interactive mode. h Prints help for resxtop (or esxtop) command-line options. v Prints resxtop (or esxtop) version number. s Calls resxtop (or esxtop) in secure mode. In secure mode, the -d command, which specifiesdelay between updates, is disabled. the delay is set to two seconds. n Number of iterations. Updates the display n times and exits. Default value is 10000.
server The name of the remote server host to connect to (required for resxtop only). that the host name needs to be the same as what is displayed in the vSphere Client. username The user name to be authenticated when connecting to the remote host. The remote serverprompts you for a password, as well (resxtop only). using the W single-key interactive command. Several statistics appear on the different panels while resxtop (or esxtop) is running in interactive mode. These statistics are common across all four panels. The Uptime line, found at the top of each of the four resxtop (or esxtop) panels, displays the current time, time since last reboot, number of currently running worlds and load averages. A world is an ESXi Vmkernel schedulable entity, similar to a process or thread in other operating systems. Below that the load averages over the past one, five, and fifteen minutes appear. Load averages take into account both running and ready-to-run worlds. A load average of 1.00 means that there is full utilization of all physical CPUs. A load average of 2.00 means that the ESXi system might need twice as many physical CPUs as are currently available. Similarly, a load average of 0.50 means that the physical CPUs on the ESXi system are half utilized. You can define the order of fields displayed in interactive mode. If you press f, F, o, or O, the system displays a page that specifies the field order on the top line and short descriptions of the field contents. If the letter in the field string corresponding to a field is uppercase, the field is displayed. An asterisk in front of the field description indicates whether a field is displayed. The order of the fields corresponds to the order of the letters in the string. Toggle the display of a field by pressing the corresponding letter. Move a field to the left by pressing the corresponding uppercase letter. Move a field to the right by pressing the corresponding lowercase letter. When running in interactive mode, resxtop (or esxtop) recognizes several single-key commands. All interactive mode panels recognize the commands listed in the following table. The command to specify the delay between updates is disabled if the s option is given on the command line. All sorting interactive commands sort in descending order. h or ? Displays a help menu for the current panel, giving a brief summary of commands, and the status of secure mode. Space Immediately updates the current panel. ^L Erases and redraws the current panel. f or F Displays a panel for adding or removing statistics columns (fields) to or from the current panel. o or O Displays a panel for changing the order of statistics columns on the current panel. number in one resxtop (or esxtop) panel, the change affects all four panels. used. You can also specify a different filename on the prompt generated by this W command. c Switch to the CPU resource utilization panel. p Switch to the CPU Power utilization panel. m Switch to the memory resource utilization panel. d Switch to the storage (disk) adapter resource utilization panel. v Switch to storage (disk) virtual machine resource utilization screen. n Switch to the network resource utilization panel. i Switch to the interrupt panel. The CPU panel displays server-wide statistics as well as statistics for individual world, resource pool, and virtual machine CPU utilization. Resource pools, virtual machines that are running, or other worlds are at times called groups. For worlds belonging to a virtual machine, statistics for the virtual machine that is running are displayed. All other worlds are logically aggregated into the resource pools that contain them. screen update. It equals the total sum of %USED for Worlds that ran on this PCPU. USED(%) can be greater than 100%. utilization averaged over all PCPUs. ID Resource pool ID or virtual machine ID of the resource pool or virtual machine of the world that isrunning, or world ID of the world that is running. GID Resource pool ID of the resource pool or virtual machine of the world that is running. NAME Name of the resource pool or virtual machine of the world that is running, or name of the world thatis running. NWLD Number of members in the resource pool or virtual machine of the world that is running. If a Groupis expanded using the interactive command e, then NWLD for all the resulting worlds is 1. %STATE TIMES Set of CPU statistics made up of the following percentages. For a world, the percentages are apercentage of one physical CPU core. %VMWAIT The total percentage of time the Resource Pool/World spent in a blocked state waiting for events. %RDY Percentage of time the resource pool, virtual machine, or world was ready to run, but was notprovided CPU resources on which to execute. %MLMTD (maxlimited) Percentage of time the ESXi VMkernel deliberately did not run the resource pool, virtual machine,or world because doing so would violate the resource pool, virtual machine, or world’s limit setting. running in this way, the %MLMTD (max limited) time is included in %RDY time. %SWPWT Percentage of time a resource pool or world spends waiting for the ESXi VMkernel to swap memory.The %SWPWT (swap wait) time is included in the %WAIT time. EVENT COUNTS/s Set of CPU statistics made up of per second event rates. These statistics are for VMware internal useonly. CPU ALLOC Set of CPU statistics made up of the following CPU allocation configuration parameters. AMIN Resource pool, virtual machine, or world attribute Reservation. AMAX Resource pool, virtual machine, or world attribute Limit. A value of -1 means unlimited. ASHRS Resource pool, virtual machine, or world attribute Shares. SUMMARY STATS Set of CPU statistics made up of the following CPU configuration parameters and statistics. Thesestatistics apply only to worlds and not to virtual machines or resource pools. AFFINITY BITMASK Bit mask showing the current scheduling affinity for the world. CPU The physical or logical processor on which the world was running when resxtop (or esxtop)obtained this information. HTQ Indicates whether the world is currently quarantined or not. N means no and Y means yes. TIMER/s Timer rate for this world. %RUN Percentage of total time scheduled. This time does not account for hyperthreading and system time.On a hyperthreading enabled server, the %RUN can be twice as large as %USED. %CSTP Percentage of time a resource pool spends in a ready, co-deschedule state.NOTE You might see this statistic displayed, but it is intended for VMware use only. POWER Current CPU power consumption for a resource pool (in Watts). %LAT_C Percentage of time the resource pool or world was ready to run but was not scheduled to run becauseof CPU resource contention. %LAT_M Percentage of time the resource pool or world was ready to run but was not scheduled to run becauseof memory resource contention. %DMD CPU demand in percentage. It represents the average active CPU load in the past minute. You can change the display using single-key commands. of a single physical CPU. If the %Used by a resource pool is 30% on a two-way server, the resource pool is utilizing 30 percent of one physical core. If the %Used by a world belonging to a resource pool is 30 percent on a two-way server, that world is utilizing 30% of one physical core. U Sorts resource pools, virtual machines, and worlds by the resource pool’s or virtual machine’s %Usedcolumn. This is the default sort order. R Sorts resource pools, virtual machines, and worlds by the resource pool’s or virtual machine’s %RDYcolumn. N Sorts resource pools, virtual machines, and worlds by the GID column. V Displays virtual machine instances only. L Changes the displayed length of the NAME column. The CPU Power panel displays CPU Power utilization statistics. On the CPU Power panel, statistics are arranged per PCPU. A PCPU is a physical hardware execution context — a physical CPU core if hyper-threading is unavailable or disabled, or a logical CPU (LCPU or SMT thread) if hyper-threading is enabled. Power Usage Current total power usage (in Watts). Power Cap Total power cap (in Watts). PSTATE MHZ Clock frequence per state. %USED Percentage of PCPU nominal frequency used since the last screen update. It is the same as PCPUUSED(%) shown in the CPU Screen. %UTIL Raw PCPU utilization, that is the percentage of real time that PCPU was not idle. It is the same asPCPU UTIL(%) shown in the CPU Screen. %Cx Percentage of time the PCPU spent in C-State ‘x’. %Px Percentage of time the PCPU spent in P-State ‘x’. %Tx Percentage of time the PCPU spent in T-State ‘x’. The Memory panel displays server-wide and group memory utilization statistics. As on the CPU panel, groups correspond to resource pools, running virtual machines, or other worlds that are consuming memory. The first line, found at the top of the Memory panel displays the current time, time since last reboot, number of currently running worlds, and memory overcommitment averages. The memory overcommitment averages over the past one, five, and fifteen minutes appear. Memory overcommitment of 1.00 means a memory overcommitment of 100 percent. PMEM (MB) Displays the machine memory statistics for the server. All numbers are in megabytes.total Total amount of machine memory in the server. vmk Amount of machine memory being used by the ESXi VMkernel. free Amount of machine memory that is free. ursvd Total amount of machine memory currently unreserved. is not under any pressure and low means that it is. NUMA (MB) Displays the ESXi NUMA statistics. This line appears only if the ESXi host is running on aNUMA server. All numbers are in megabytes. The total amount of machine memory in the NUMA node that is managed by ESXi. The amount of machine memory in the node that is currently free (in parentheses). PSHARE (MB) Displays the ESXi page-sharing statistics. All numbers are in megabytes.shared Amount of physical memory that is being shared. common Amount of machine memory that is common across worlds. SWAP (MB) Displays the ESXi swap usage statistics. All numbers are in megabytes.curr Current swap usage. rclmtgt Where the ESXi system expects the reclaimed memory to be. Memory can be reclaimed by swapping or compression. w/s Rate at which memory is swapped to disk by the ESXi system. ZIP (MB) Displays the ESXi memory compression statistics. All numbers are in megabytes.zipped Total compressed physical memory. saved Saved memory by compression. reclaim using the vmmemctl module. AMIN Memory reservation for this resource pool or virtual machine. AMAX Memory limit for this resource pool or virtual machine. A value of -1 means Unlimited. ASHRS Memory shares for this resource pool or virtual machine. NHN Current home node for the resource pool or virtual machine. This statistic is applicable onlyon NUMA systems. If the virtual machine has no home node, a dash (-) appears. NRMEM (MB) Current amount of remote memory allocated to the virtual machine or resource pool. Thisstatistic is applicable only on NUMA systems. N% L Current percentage of memory allocated to the virtual machine or resource pool that is local. MEMSZ (MB) Amount of physical memory allocated to a resource pool or virtual machine. GRANT (MB) Amount of guest physical memory mapped to a resource pool or virtual machine. Theconsumed host machine memory is equal to GRANT – SHRDSVD. SZTGT (MB) Amount of machine memory the ESXi VMkernel wants to allocate to a resource pool or virtualmachine. TCHD (MB) Working set estimate for the resource pool or virtual machine. %ACTV Percentage of guest physical memory that is being referenced by the guest. This is aninstantaneous value. %ACTVS Percentage of guest physical memory that is being referenced by the guest. This is a slowmoving average. %ACTVF Percentage of guest physical memory that is being referenced by the guest. This is a fastmoving average. MCTL? Memory balloon driver is installed or not. N means no, Y means yes. MCTLSZ (MB) Amount of physical memory reclaimed from the resource pool by way of ballooning. MCTLTGT (MB) Amount of physical memory the ESXi system attempts to reclaim from the resource pool orvirtual machine by way of ballooning. SWCUR (MB) Current swap usage by this resource pool or virtual machine. SWTGT (MB) Target where the ESXi host expects the swap usage by the resource pool or virtual machineto be. SWR/s (MB) Rate at which the ESXi host swaps in memory from disk for the resource pool or virtualmachine. SWW/s (MB) Rate at which the ESXi host swaps resource pool or virtual machine memory to disk. LLSWR/s (MB) Rate at which memory is read from the host cache. 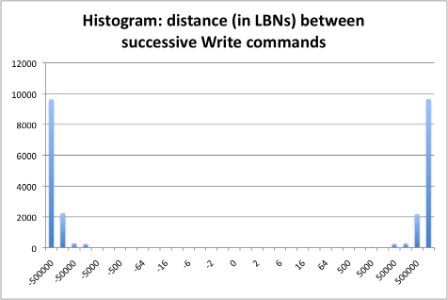 LLSWW/s (MB) Rate at which memory is written to the host cache from various sources. CPTRD (MB) Amount of data read from checkpoint file. CPTTGT (MB) Size of checkpoint file. ZERO (MB) Resource pool or virtual machine physical pages that are zeroed. SHRD (MB) Resource pool or virtual machine physical pages that are shared. SHRDSVD (MB) Machine pages that are saved because of resource pool or virtual machine shared pages. OVHD (MB) Current space overhead for resource pool. OVHDMAX (MB) Maximum space overhead that might be incurred by resource pool or virtual machine. GST_NDx (MB) Guest memory allocated for a resource pool on NUMA node x. This statistic is applicable onNUMA systems only. OVD_NDx (MB) VMM overhead memory allocated for a resource pool on NUMA node x. This statistic isapplicable on NUMA systems only. TCHD_W (MB) Write working set estimate for resource pool. CACHESZ (MB) Compression memory cache size. CACHEUSD (MB) Used compression memory cache. ZIP/s (MB/s) Compressed memory per second. UNZIP/s (MB/s) Decompressed memory per second. M Sort resource pools or virtual machines by MEMSZ column. This is the default sort order. B Sort resource pools or virtual machines by Group Memctl column. N Sort resource pools or virtual machines by GID column. V Display virtual machine instances only. Statistics in the Storage Adapter panel are aggregated per storage adapter by default. Statistics can also be viewed per storage path. ADAPTR Name of the storage adapter. PATH Storage path name. This name is only visible if the corresponding adapter is expanded. AQLEN Current queue depth of the storage adapter. CMDS/s Number of commands issued per second. READS/s Number of read commands issued per second. 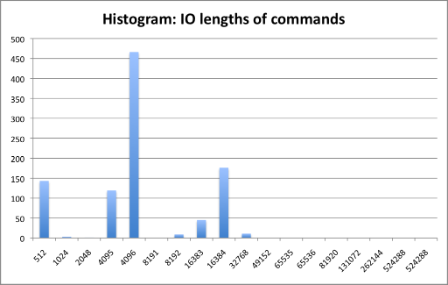 WRITES/s Number of write commands issued per second. MBREAD/s Megabytes read per second. MBWRTN/s Megabytes written per second. RESV/s Number of SCSI reservations per second. CONS/s Number of SCSI reservation conflicts per second. DAVG/cmd Average device latency per command, in milliseconds. KAVG/cmd Average ESXi VMkernel latency per command, in milliseconds. GAVG/cmd Average virtual machine operating system latency per command, in milliseconds. QAVG/cmd Average queue latency per command, in milliseconds. DAVG/rd Average device read latency per read operation, in milliseconds. KAVG/rd Average ESXi VMkernel read latency per read operation, in milliseconds. GAVG/rd Average guest operating system read latency per read operation, in milliseconds. QAVG/rd Average queue latency per read operation, in milliseconds. DAVG/wr Average device write latency per write operation, in milliseconds. KAVG/wr Average ESXi VMkernel write latency per write operation, in milliseconds. 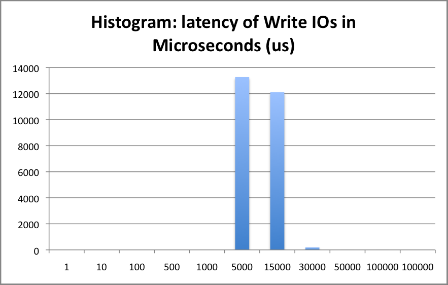 GAVG/wr Average guest operating system write latency per write operation, in milliseconds. QAVG/wr Average queue latency per write operation, in milliseconds. FCMDS/s Number of failed commands issued per second. FREAD/s Number of failed read commands issued per second. FWRITE/s Number of failed write commands issued per second. FMBRD/s Megabytes of failed read operations per second. FMBWR/s Megabytes of failed write operations per second. FRESV/s Number of failed SCSI reservations per second. ABRTS/s Number of commands aborted per second. RESETS/s Number of commands reset per second. PAECMD/s The number of PAE (Physical Address Extension) commands per second. PAECP/s The number of PAE copies per second. SPLTCMD/s The number of split commands per second. SPLTCP/s The number of split copies per second. The following table displays the interactive commands you can use with the storage adapter panel. storage adapter. You are prompted for the adapter name. r Sorts by READS/s column. w Sorts by WRITES/s column. R Sorts by MBREAD/s read column. T Sorts by MBWRTN/s written column. N Sorts first by ADAPTR column, then by PATH column. This is the default sort order. The storage device panel displays server-wide storage utilization statistics. By default, the information is grouped per storage device. You can also group the statistics per path, per world, or per partition. DEVICE Name of the storage device. PATH Path name. This name is visible only if the corresponding device is expanded to paths. WORLD World ID. This ID is visible only if the corresponding device is expanded to worlds. PARTITION Partition ID. This ID is visible only if the corresponding device is expanded to partitions. SHARES Number of shares. This statistic is applicable only to worlds. BLKSZ Block size in bytes. NUMBLKS Number of blocks of the device. DQLEN Current device queue depth of the storage device. device is expanded to worlds. ACTV Number of commands in the ESXi VMkernel that are currently active. This statistic applies to onlyworlds and devices. QUED Number of commands in the ESXi VMkernel that are currently queued. This statistic applies to onlyworlds and devices. %USD Percentage of the queue depth used by ESXi VMkernel active commands. This statistic applies to onlyworlds and devices. LOAD Ratio of ESXi VMkernel active commands plus ESXi VMkernel queued commands to queue depth. Thisstatistic applies to only worlds and devices. DAVG/cmd Average device latency per command in milliseconds. KAVG/cmd Average ESXi VMkernel latency per command in milliseconds. GAVG/cmd Average guest operating system latency per command in milliseconds. QAVG/cmd Average queue latency per command in milliseconds. DAVG/rd Average device read latency per read operation in milliseconds. KAVG/rd Average ESXi VMkernel read latency per read operation in milliseconds. GAVG/rd Average guest operating system read latency per read operation in milliseconds. QAVG/rd Average queue read latency per read operation in milliseconds. DAVG/wr Average device write latency per write operation in milliseconds. KAVG/wr Average ESXi VMkernel write latency per write operation in milliseconds. GAVG/wr Average guest operating system write latency per write operation in milliseconds. QAVG/wr Average queue write latency per write operation in milliseconds. PAECMD/s Number of PAE commands per second. This statistic applies to only paths. PAECP/s Number of PAE copies per second. This statistic applies to only paths. SPLTCMD/s Number of split commands per second. This statistic applies to only paths. SPLTCP/s Number of split copies per second. This statistic applies to only paths. The following table displays the interactive commands you can use with the storage device panel. for the device name. The statistics are per world per device. are prompted for the device name. T Sort by MBWRTN column. N Sort first by DEVICE column, then by PATH, WORLD, and PARTITION column. This is the default sortorder. L Changes the displayed length of the DEVICE column. This panel displays virtual machine-centric storage statistics. By default, statistics are aggregated on a per-resource-pool basis. One virtual machine has one corresponding resource pool, so the panel displays statistics on a per-virtual-machine basis. You can also view statistics on per-VSCSI-device basis. ID Resource pool ID or VSCSI ID of VSCSI device. VMNAME Name of the resource pool. VSCSINAME Name of the VSCSI device. LAT/rd Average latency (in milliseconds) per read. LAT/wr Average latency (in milliseconds) per write. The following table lists the interactive commands you can use with the virtual machine storage panel. group ID. The statistics are per VSCSI device. N Sort first by VMNAME column, and then by VSCSINAME column. This is the default sort order. The Network panel displays server-wide network utilization statistics. Statistics are arranged by port for each virtual network device configured. For physical network adapter statistics, see the row in the table that corresponds to the port to which the physical network adapter is connected. For statistics on a virtual network adapter configured in a particular virtual machine, see the row corresponding to the port to which the virtual network adapter is connected. PORT-ID Virtual network device port ID. UPLINK Y means the corresponding port is an uplink. N means it is not. UP Y means the corresponding link is up. N means it is not. SPEED Link speed in Megabits per second. FDUPLX Y means the corresponding link is operating at full duplex. N means it is not. USED-BY Virtual network device port user. DTYP Virtual network device type. H means HUB and S means switch. DNAME Virtual network device name. PKTTX/s Number of packets transmitted per second. PKTRX/s Number of packets received per second. MbTX/s MegaBits transmitted per second. MbRX/s MegaBits received per second. %DRPTX Percentage of transmit packets dropped. %DRPRX Percentage of receive packets dropped. TEAM-PNIC Name of the physical NIC used for the team uplink. PKTTXMUL/s Number of multicast packets transmitted per second. PKTRXMUL/s Number of multicast packets received per second. PKTTXBRD/s Number of broadcast packets transmitted per second. PKTRXBRD/s Number of broadcast packets received per second. The following table displays the interactive commands you can use with the network panel. T Sorts by Mb Tx column. R Sorts by Mb Rx column. t Sorts by Packets Tx column. r Sorts by Packets Rx column. N Sorts by PORT-ID column. This is the default sort order. L Changes the displayed length of the DNAME column. The interrupt panel displays information about the use of interrupt vectors. COUNT/s Total number of interrupts per second. This value is cumulative of the count for every CPU. COUNT_x Interrupts per second on CPU x.
TIME/int Average processing time per interrupt (in microseconds). TIME_x Average processing time per interrupt on CPU x (in microseconds). DEVICES Devices that use the interrupt vector. If the interrupt vector is not enabled for the device, its name isenclosed in angle brackets (< and >). vSphere Monitoring and Performance Guide, Chapter 7 “Performance Monitoring Utilities: resxtop and esxtop”, page 59. Batch mode allows you to collect and save resource utilization statistics in a file. After you prepare for batch mode, you can use esxtop or resxtop in this mode. To run in batch mode, you must first prepare for batch mode. Run resxtop (or esxtop) in interactive mode. In each of the panels, select the columns you want. Save this configuration to a file (by default ~/.esxtop50rc) using the W interactive command. You can now use resxtop (or esxtop) in batch mode. After you have prepared for batch mode, you can use esxtop or resxtop in this mode. Start resxtop (or esxtop) to redirect the output to a file. The filename must have a .csv extension. The utility does not enforce this, but the post-processing tools require it. Process statistics collected in batch mode using tools such as Microsoft Excel and Perfmon. In batch mode, resxtop (or esxtop) does not accept interactive commands. In batch mode, the utility runs until it produces the number of iterations requested (see command-line option n, below, for more details), or until you end the process by pressing Ctrl+c. You can use batch mode with command-line options. b Runs resxtop (or esxtop) in batch mode. the W single-key interactive command. d Specifies the delay between statistics snapshots. The default is five seconds. The minimum is twoseconds. If a delay of less than two seconds is specified, the delay is set to two seconds. n Number of iterations. resxtop (or esxtop) collects and saves statistics this number of times, andthen exits. server The name of the remote server host to connect to (required, resxtop only). the host name needs to be the same as what appears in the vSphere Client. username The user name to be authenticated when connecting to the remote host. You are prompted by theremote server for a password, as well (resxtop only). To run in replay mode, you must prepare for replay mode. Run vm-support in snapshot mode in the ESXi Shell. Unzip and untar the resulting tar file so that esxtop can use it in replay mode. You can now use esxtop in replay mode. You can use esxtop in replay mode. Replay mode can be run to produce output in the same style as batch mode (see the command-line option b, below). NOTE Batch output from esxtop cannot be played back by resxtop. Snapshots collected by vm-supported can be replayed by esxtop. However, vm-support output generated by ESXi can be replayed only by esxtop running on the same version of ESXi. To activate replay mode, enter the following at the command-line prompt. You can use replay mode with command-line options. The following table lists the command-line options available for esxtop replay mode. R Path to the vm-support collected snapshot’s directory. B Runs esxtop in Batch mode. d Specifies the delay between panel updates. The default is five seconds. The minimum is twoseconds. If a delay of less than two seconds is specified, the delay is set to two seconds. N Number of iterations esxtop updates the display this number of times and then exits. “Using vscsiStats for Storage Performance Analysis“, from the VMware Communities seems to be the official documentation on this subject. Unofficial are a lot of excellent Blog posts. I will mention a few in the “Other references” section. esxtop is a great tool for performance analysis of all types. However, with only latency and throughput statistics, esxtop will not provide the full picture of the storage profile. Furthermore, esxtop only provides latency numbers for Fibre Channel and iSCSI storage. Latency analysis of NFS traffic is not possible with esxtop. Documentation on command-line parameters are available when running ‘/usr/lib/vmware/bin/vscsiStats -h’. This command starts the process that will accrue statistics. The world group ID must be set to a running virtual machine. The running VMs’ IDs can be obtained by running ‘/usr/lib/vmware/bin/vscsiStats -l’. After about 30 minutes vscsiStats will stop running. If the analysis is needed for a longer period, the start command should be repeated above in this window. That will defer the timeout and termination by another 30 minutes. Since results are accrued and reported out in summary, the histograms will include data since collection was started. To reset all counters to zero, run ‘/usr/lib/vmware/bin/vscsiStats -r’. The histogram type is used to specify either all of the statistics or one group of them. Options include all, ioLength, seekDistance, outstandingIOs, latency, interarrival. Results can be produced in a more compact comma-delimited list by adding the optional “-c” above. Storage arrays can process sequential IO much faster than random IO. You can therefore improve the performance of a sequential workload by placing it on a dedicated LUN to allow the array to optimize access. vscsiStats can help you identify your sequential workloads even if you don’t understand anything about the application in the VM. 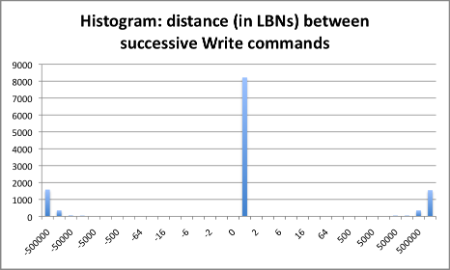 In this case the logical block number (LBN) of each command is most frequently exactly one larger than the previous command. That’s the signature of a heavily sequential workload. It shouldn’t surprise you to learn that both of these profiles were generated by Iometer using random and sequential writes, respectively. From these results I can see that about a quarter of the commands came in IOs smaller than 4k. About half of the commands were sized to 4k commands. The minute number of remaining IOs were larger than 4k. This signature is common of a VMDK formatted to 4k blocks and supporting OS and application execution. The storage array should be optimized for 4k blocks if this disk’s performance is a priority. esxtop is a terrific tool for latency-based storage analysis. Fibre Channel and iSCSI HBAs have device and kernel latencies in esxtop’s storage panel. Software iSCSI initiators will show up as vmhba32 (ESX 3.5 and earlier) and vmhba33 (ESX 4.0 and later.) But esxtop does not provide latency statistics for NFS stores. Because vscsiStats collects its results where the guest interacts with the hypervisor, it is unaware of the storage implementation. Latency statistics can be collected for all storage configurations with this tool. The above graph shows that the server in my office with a single direct-attached SCSI disk is performing as I would expect. About half of all the operations are completing in under 5 ms. The other half take 5-15 ms to complete. A few commands took longer than 15 ms, but the number is so small that it doesn’t concern me. Similar results can be seen with NFS arrays. vscsiStats can be installed on ESXi hosts after putting the host into tech support mode. More information on this process is availalble on Scott’s blog on the subject on vPivot. Now you know everything about the statisctics, but what are the thresholds? Read this excellent post on esxtop by Duncan Epping.